Casket carrying late Gov. Marvin Mandel arrives at State House. From Larry Hogan's Facebook page. 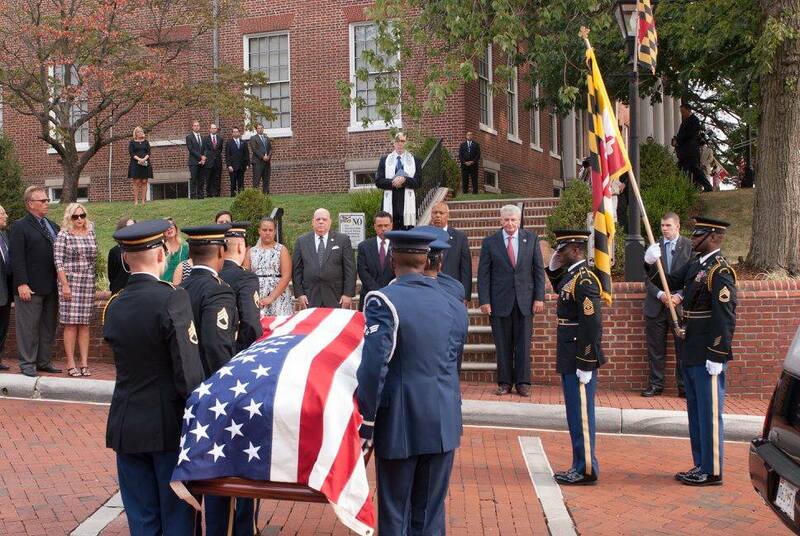 MANDEL HONORED AT STATE HOUSE: Maryland’s political establishment paid its respects Wednesday to former Gov. Marvin Mandel at the State House in Annapolis, temporarily replacing the building’s late-summer humdrum with ceremony, reverence and a steady trickle of visitors, Josh Hicks reports in the Post. In the rotunda of the State House, where the body of former Gov. Marvin Mandel lay in a flag-draped coffin, former Gov.Bob Ehrlich stepped away from a throng of mourners. To Ehrlich’s right, a group of Democratic legislators stood chatting. To his left, a few high-profile Republicans traded tales of Mandel. The groups interacted freely, often laughing. To Ehrlich, a Republican, that made a powerful point about the state’s 56th governor, a Democrat, Jonathan Pitts reports in the Sun. Here’s a video of Mandel’s casket being moved into the State House. Video by the Josh McKerrow of the Sun. Karen Hosler of WYPR-FM has this audio report. NAMED LOWERY’S INTERIM SUB: Jack Smith, former superintendent of Calvert County Public Schools, has been named interim state superintendent following the abrupt resignation of Lillian Lowery from the Maryland State Department of Education, Sara Newman reports for the Calvert Recorder. Smith, formerly Lowery’s deputy superintendent, is expected to finish what is left of Lowery’s four-year term, which ends next July. MARYLAND LOSING TAXPAYERS: Meg Tully of MarylandReporter.com writes that recently released data from the IRS shows that about 5,500 more taxpayers left Maryland in 2012 than moved into the state. Long-cited by tax critics as annual data that show the migration of taxpayers to lower-taxed states, some experts caution that not too much should be read into year-to-year changes. EX-CANDIDATE SUES ON REDISTRICTING: Amanda Yeager of the Howard County Times reports that a former candidate for the Maryland House of Delegates says the state’s method of dividing land into voting districts violates his constitutional rights and harmed his campaign. Christopher Eric Bouchat ran unsuccessfully last year for a delegate seat in House District 9A. Bouchat lost in the Republican primary to Howard County candidates Warren Miller and Trent Kittleman, who went on to win the general election. 2 NAMED TO PORT PANEL: Gov. Larry Hogan has appointed two business executives as the newest members of the Maryland Port Commission, which is charged with keeping Baltimore’s port competitive within international maritime trade, Lorraine Mirabella writes in the Sun. Brenda Dandy and Walter Tilley will join current commissioners Donald Fry, the Rev. Donte Hickman Sr., Ted Venetoulis and David Richardson. ON LEAD PAINT SETTLEMENT DEALS: Dan Rodricks speaks with Post reporter Terrence McCoy about his story on how companies have turned buying lead paint settlements from poor, black lead paint poisoned victims into a multi-billion dollar industry. Also on the show are Ruth Ann North, president and CEO of the Green and Healthy Homes Initiative,and Saul Kerpelman, a Baltimore lawyer who has represented thousands of children poisoned by lead paint. RX POT FARMING PLANS: Some farmers and other investors are already lining up in the hopes of getting in on the ground floor of what they hope will be a growth industry in both growing and dispensing medical marijuana, writes Bryan Sears for the Daily Record. At least two farming operations in northern Baltimore County are calling on the County Council to amend a proposed law to allow the growing of medical cannabis in rural areas of the county. HOYER TOURS VETERANS CENTER: Rep. Steny Hoyer toured a veterans center in Baltimore on Wednesday as city and federal leaders have renewed their focus on confronting veterans homelessness, John Fritze reports for the Sun. Hoyer, the second-highest ranking Democrat in the House, visited with officials at the Maryland Center for Veterans Education and Training, a Jonestown facility that recently won a piece of a $48 million grant from the U.S. Department of Housing and Urban Development to address homelessness. MIKULSKI KEY TO OBAMA IRAN DEAL VICTORY: Sen. Barbara Mikulski handed President Barack Obama a victory Wednesday by announcing her support for the pending Iran nuclear agreement, providing the final vote needed to ensure the deal will survive GOP opposition in Congress, John Fritze reports in the Sun. CARDIN STILL WRESTLING OVER DEAL: Even as his colleague from Maryland on Wednesday provided the final vote needed for President Obama’s Iran deal to survive, Sen. Ben Cardin continues to wrestle with whether to support the deal — a decision that has pitted him against his rabbi, riled his constituents and consumed him for much of the past month, Rachel Weiner reports in the Post. DELANEY TALKS IRAN DEAL: Blogger Ryan Miner talks with U.S. Rep. John Delaney about the proposed U.S.-Iran nuclear deal and what kind of deal he believes it is for both the U.S. and Iran. The discussion last for about 20 minutes. O’MALLEY ON THE AIR: Martin O’Malley was given about 20 minutes of a 50-minute national radio show yesterday when he was interviewed by Tom Ashbrook for the show On Point. You can hear O’Malley here. Correction: In yesterday’s Roundup, we misspelled the first name of WYPR-FM’s Sheilah Kast. Thanks to Andrew Schotz for calling this to our attention.